If you need power and room, the 2008 Chevrolet Equinox offers some of the best passenger and cargo space in its class, as well a standard V6 engine. The muscular good looks, comfy seats and long list of optional features are just icing on the cake. Stop throwing money down the drain and go buy a Chevy Equinox. Our Chevy Equinox is a 2008 model SUV. It has been a very good car for our family. Radio/stereo works well, for singing with the kids on the way to school. It has amazing trunk space! Awesome space to go do groceries or for any trip you may have planned. Such as, a day at the beach! You can store your cooler, pool noodles, and bags. Drives good in any season for the most part. When I gave birth to my daughter in February we got to come home on a very cold and snowy day and our SUV helped us get home safe with our newborn. Great air conditioner during the hot summer days. Heat works great as well for them cold winter mornings. Good interior and exterior. Has tan leather seats inside and black glossy exterior. Had it for 2 years so far and only had to change a few things. Had to fix a headlight and brake light early this year. Recently changed front brakes and back brakes. Other than that we have had our regular oil changes and our SUV has been running great. It may be a little older for all the new models out today, but I love it! I would definitely recommend it to anyone with kids! For example, a soccer mom. You can put a cooler and other necessities in the truck for a soccer game away from home. Or for long trips. This SUV is also great with gas! And will not drain your wallet. 10/10 recommendation. I love my vehicle and it is very dependable. It gets me from point A to B. My vehicle is dependable and I love driving it. Most people do not like the Equinox. I love the color and the body and shape. It gets good gas mileage and gets me from point A to point B. I also have a spare tire. I keep the oil changed and tires rotated. My car is the most precious thing to me and I wouldn't sell it if it came to the last thing I had to do in order to get money. I am very grateful to have my car. My car is bought and paid for so therefore I am most grateful for not having a car note. I don't really have the funds to make payments anyway so it works out for the better. My car is very spacious. There's room for the car seat and about 5 to 7 passengers. My car is good for road trips I have only taken two and the year that I have had my vehicle. And I have not had any problems with my vacations with my car breaking down or anything of that nature. 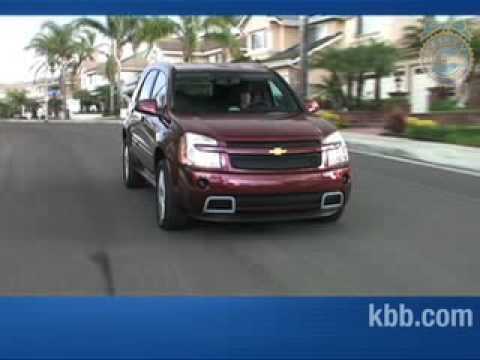 What I like about the 2008 Chevrolet Equinox and the issues we have had with it. We bought our 2008 Chevy Equinox used about 3 years ago. For the most part it is a good car. It is fun to drive, much like a go cart and gets good gas mileage. The seats are comfortable and it is very spacious. The back "trunk" space is nice and big and easily accessible. The negatives are that something seems to always be going wrong. First it was the ac, then the alternator. Now we are having to replace the upper and lower radiator hoses and the bleeder screw. We have a possible blown head gasket but that is yet to be confirmed. I would buy a newer model of this vehicle if they have worked out the original kinks.